Fitzroy-ACU ruck star Tash Ross-Harris has taken out the Inaugural William Buck Premier Women’s Best and Fairest at the VAFA Wilson Women’s awards night on Monday. It was a stunning effort from Rosso, who was best on ground in seven of her first 10 games for the season! She was a mile in front of the competition, finishing up with 27 votes from 12 games, nine points clear of her closest rival. Just a day after the team went down to Marcellin in the Preliminary Final, Tash took to the podium to accept her award and expressed her love for her team and club. Just imagine what the girl could do if she could kick straight! (a weakness she admitted during her acceptance speech). With a final sting in the tail, Rosso announced that she would be travelling to Argentina next year and footy would have to wait. Women 1 captain, Gemma Minuz, who attended the awards night as part of the Fitzroy posse and also finished 10th in the B&F herself, said of her team mate “We are unbelievably proud of Rosso and glad, but not in the least bit surprised, that the umpires recognised her dominance all season too. “Rosso is a modern-day ruck – she knows that it isn't enough to rely on her height and brings an incredible leap, solid pack marks, the ability to rove her own ball and read the play which puts her above the pack each week. Congratulations Rosso on such an incredible effort in the first season of VAFA women’s football. For the VAFA story and the full list of votes click here. 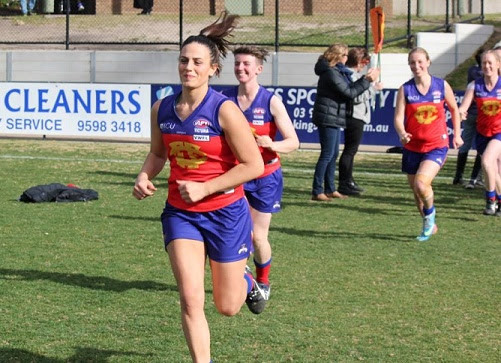 Take a look at the extensive coverage on our Facebook page this week for more photos and reactions from her team mates and other Fitzroy fans. 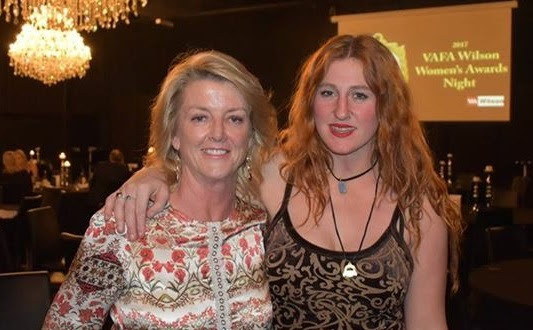 Rosso is pictured with VAFA Women’s Football Development Manager, Shona MacInnes. It’s been a big week of highs and lows across the Fitzroy Football Club and no one could capture it better than Stephen J Fenton (King George III) as he did for The Footy Almanac this week. We’ve taken the liberty of reprinting King George’s words in the Red Roy to give you a taste of goings on at Brunswick Street. FITZROY.. Stereofini ; FITZROY.. Stereofairest (and best).. the club we hold so dear..
After speaking to the players pre game, special guest, Laurie Serafini, was about to address the assembled luncheon gathering when who should stride down the hallway past the dining tables, without prior announcement, or breaking stride and join him at the lectern? None other than his beloved older brother Renato of course! With Renato firing the questions and Laurie, with circumloquaciousness, answering them a wonderful performance of to and fro ensued and revealed a Philadelphian bond between these ‘boyhood Blues barracking brothers’. In his rolling, rambling Roys reminisce Laurie focused on the numbers. He told us Renato’ s first number with Fitzroy was #47, his own first number #37 their joint shared second number being #10 the difference between their originals. He spoke of the great Roy numbers #1 worn by Kevin Murray and Paul Roos and number #29 worn by Gary Wilson. It was brought to his attention with prescience by a fellow I know well that these were the very same numbers that the present football team in current configuration was hoping would be relied upon this day to stave off relegation. More on these numbers later. Laurie related his journey from teenage first game full forward kicking 4 goals (only to end with a career total of 9 goals). He was moved thereafter to the wing where first up he played on Keith Greig then Geoff Raines followed by Robbie Flower and finally Michael Turner. Luckily at that time Harvey Merrigan was expressing dissatisfaction with playing at fullback and a less than willing Laurie found himself slotted in that position which he made his own against the likes of Garry Ablett Snr, Tony Lockett, Stephen Silvagni, Jason Dunstall et alia. He lamented that he played at fullback, starved of action, in the still VFL record scoring Fitzroy team that booted 36.22.238 in R17 at Waverley Park in 1979. Fortunately, Fitzroy stalwart supporter David Leydon mentioned that their opponent that day Melbourne booted 6.12.48 which meant Laurie could add the ‘no doubt’ 12 accurate ‘coast-to-coast kickouts’ to his stats and claim as a result 18 of the goals scored! He spoke of Renato’s Fitzroy reserve team premiership in 1974 and his own night premiership in 1979. He concluded with the excellent advice to always include your wife in the leadership team at home and in his role as health and wellness ambassador for blokes and ladies to keep up health checks so as to obtain early diagnosis and avoid the consequences of the stoic “she’ll be right” approach. On the field it came to pass with the recuperated ‘Roo’ Rory #1 kick starting our day with the first goal, our # 37wily Willy wolf, whose brothers are like sons to my above mentioned prescient friend, the second goal, the President’s son #10 Tom Cheshire winning the ‘1%ters award’ and Julian Turner #47 continuing his rich vein of excellent form. Number #29 Nathan Ligris could make Gumby, Butta Fingas and Mr Sitter all stack up serviceable non-clanger stats such is the precision of his ball delivery; one word of advice to this future Captain - don’t aim at the point posts when shooting at goal, you’ve hit them at least 4 times this year; hit the guys ‘waving not drowning’ between the goals! With 7 ft Gator, ‘Bonsai Mountain Ash’ Maloney, Cailean ‘see’ Moore and ‘Leaping Bambino’ Nino Lazaro and a 1st quarter that showcased their true ability the Roys are now a good chance to avoid the jump. Let us start with putting Scotch on the rocks this Saturday. Finally, a big shout out to our Women’s senior team who sadly but brave-heartedly finished their finals campaign last Sunday and especially to our medal winning Tasha Ross-Harris. 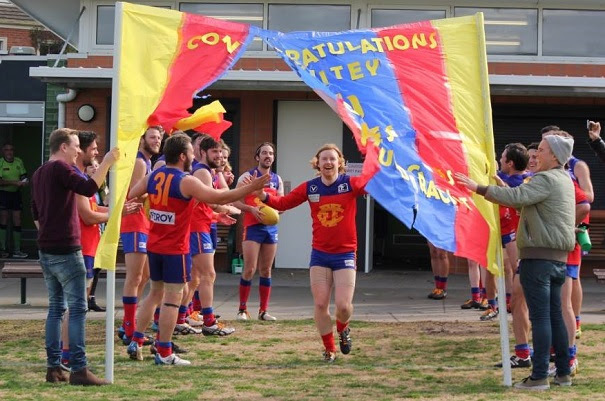 And with Rory the 2016* fairest and best in men’s Premier B Fitzroy have another first, for at least six weeks, both men and women competition reigning champions. Well done to them and all on the Board and coaches, support staff and especially Sharon Torney for making us feel, in their reflected glory, like heroes even if only for a day. (*in fact it was 2015, but who are we to spoil King George’s story!). To see all of the Fitzroy content on The Footy Almanac, bookmark this link or subscribe. 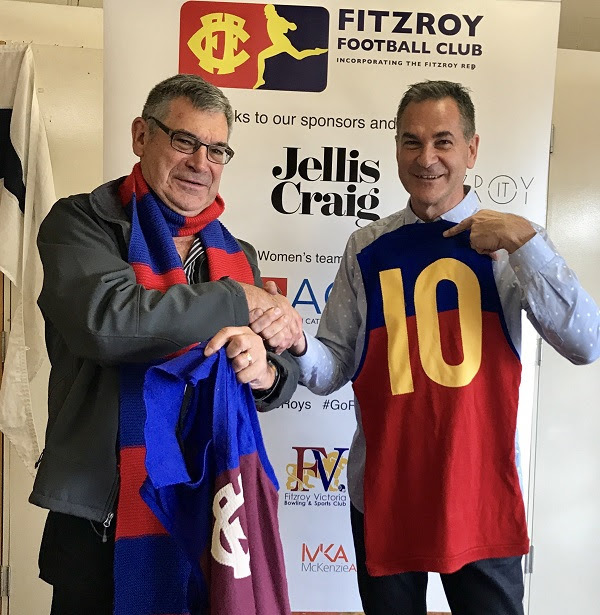 Fitzroy snapped a six-game losing streak in the most emphatic fashion, defeating the more fancied Old Carey to give themselves a good chance of staying in Premier B. In an outstanding team display across the ground, young gun Nino Lazzaro was named best on ground, with Matthew Gaite playing his best game for the club and also acknowledged by the coaches and crowd. The inclusion of some of the bigger bodies and experienced heads back from injury, captain Rory Angiolella and Will Fenton, set the game off on the right track with the first two goals and worked beautifully with the other team leaders (Tom Cheshire, Nathan Ligris, Julian Turner) to bring out the best in the team under considerable duress. The game was barely started when Fitzroy went two players down on the bench, with Mark Obushak tearing his ACL and Michael Cussen, in his first game back in seniors for a considerable time, suffering a concussion. Jack Dalton also game off bleeding and bruised in several places, but as is his toughness, he soldiered on and saw the game out in his usual uncompromising fashion. In his first senior game, small forward Ash Moloney also came in for a mention from the coaches for his two-goal and highly competitive effort; definitely something to build on there. With Peter Baccanello already out of the side with a hamstring injury, it was also a fantastic defensive display with Bill Clayton really building in confidence each week. For more of the on and off field excitement, check out Phil Hill’s unique coverage in The Footy Almanac. This week the challenge is significant against second placed Old Scotch at Camberwell, with the remaining two games against Parkdale (at BSO) and Ajax (away). The 17 point win over Carey keeps the Seniors one game clear of the bottom two, but at least one other win (and maybe two) is required to ‘stay up’. The Reserves were also cruelled with injury early in the game and after a competitive first half, were overrun by Old Carey in the second, going down 6.8.44 to 15.8.98. 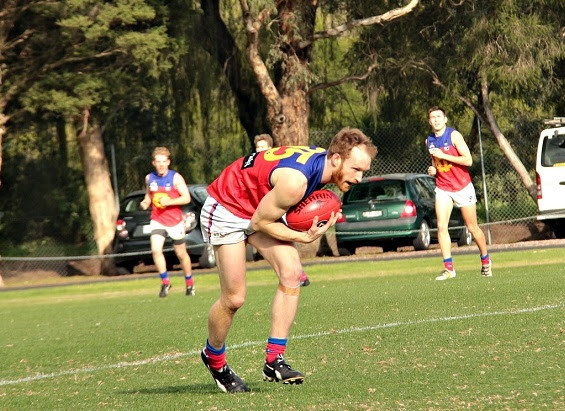 Congratulations to the beautifully balanced and ever-reliable Nick Marshall who played his 100th game for Fitzroy last weekend. We will have some more on that in next week’s Red Roy. Off-field one Eddie Betts had quietly slipped into the ground with his family to take a look at brother-in-law, Tom Scullie in action … or maybe he’d just heard about the burgers. 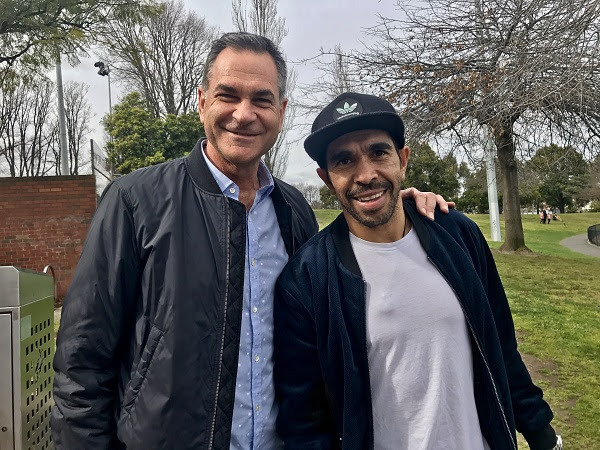 Eddie is pictured with Laurie Serafini at Brunswick Street Oval last Saturday. 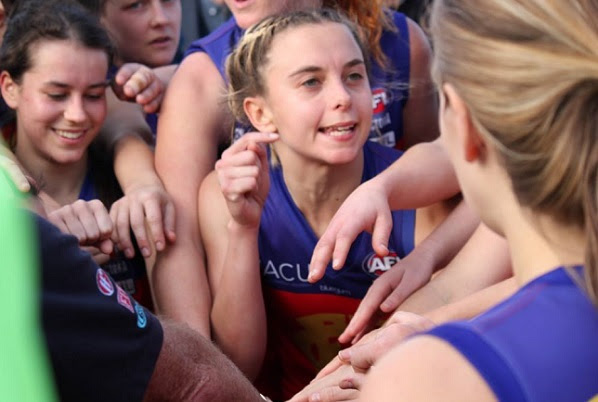 Having sat comfortably in the top two all season, Fitzroy-ACU Women 1 experienced the old cliché, anything can happen in finals, as they went down to Marcellin in the Preliminary Final at Trevor Barker Oval on Sunday. 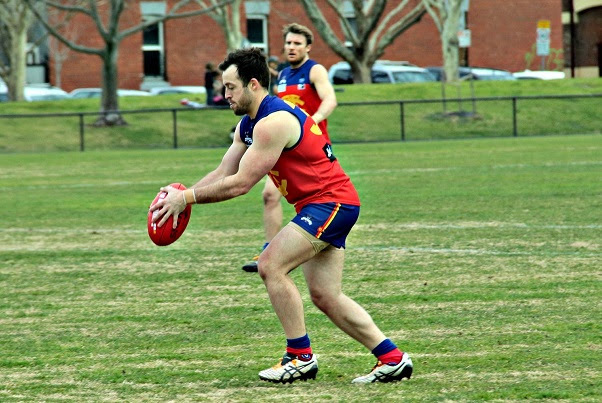 In a game where Fitzroy dominated possession and field position, they simply couldn’t put the score on the board and despite their best efforts will not compete in this weekend’s grand final. “After the loss to SKOBS on the Saturday we hit training on Monday night with sore bodies but clear minds – it was obvious that physically we were there, our intent and endeavour could not be faulted. But there were some elements missing in our game plan that we set about addressing. “On Wednesday night Mick (Symons) and Lauch (Dalgleish) worked with purpose and clarity giving each line clear and simple instructions on what to do for the weekend. There were definitely nerves, but I left the track believing 100% that we now had what it took to get the win against Marcelin. “But in the old cliché anything can happen in finals. “It’s safe to say that we were all pretty shattered after the game – physically and emotionally. “With the benefit of a few days between Sunday and now I'm hoping that the girls have had time to reflect on what was said after the game – I am incredibly proud of how far we have come as a team this year. “From when Mick stumbled upon a bunch of individual young women a few weeks before the season – some who couldn't get through the warm up without being pooped and plenty who hadn't ever played a game – we have grown into a team of talented, intelligent and team-oriented footballers who left everything that they had out in the middle of the massive Trevor Barker Oval. “The tears after the game were in part due to that recognition of how far we've come together, but also just how much the whole squad have invested in the season that was. The disappointment wasn't just for the ones playing in the game to have missed out on the grand final, but for every single Roy Girl that sweated it out during pre season and freezed their bums off at training every week. For every supporter that trecked over Melbourne (and paid $17 for parking in Sandy) cheering on the Roy Girls, for our coaches and the club that have given so much throughout the year – we wanted that grand final for them too. Thank you Roy Girls and Gemma for a wonderful season. After Rosso outed the team on Monday night for their singing circle, it has to be noted that the team bonded post-game to Natalie Imbruglia’s ‘Torn’. In a game that holds no fears, the Fitzroy Thirds will play in the sudden death first Semi Final against Ajax at Gary Smorgon Oval on Sunday at 2pm. 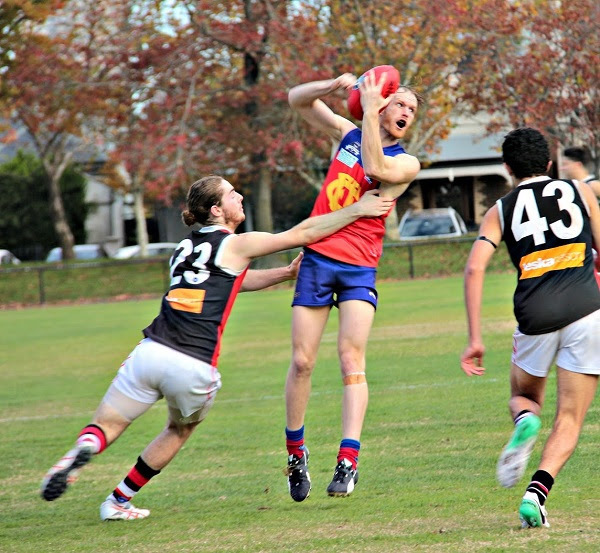 Fitzroy secured its finals berth with a massive win over Old Carey on Saturday, 22.15.147 to 6.6.42. Man mountain Simon Heather at full forward kicked a huge 11 goals, giving him an unassailable lead in the Thirds goal kicking for the season. Great form to be taking into finals. This will be the second meeting of the sides in two weeks and while Ajax won two weeks ago at BSO, the game was very close and competitive, such that Fitzroy should go into the game with a strong sense that this is a winnable final. They are playing some great footy. 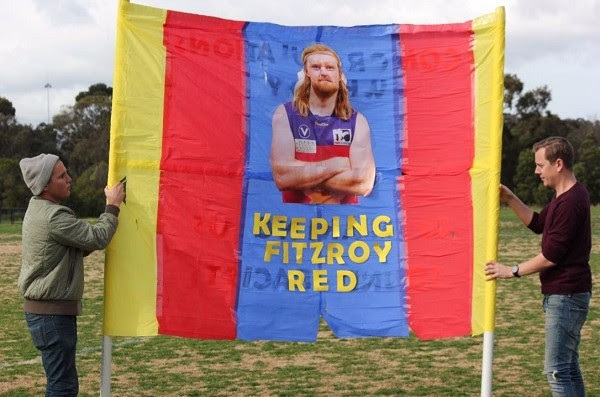 Maintaining their mantle as the best banner builders at Fitzroy, the lads did the traditional Fitzroy thing and acknowledged the 51st game of Nathan White at Ramsden Street on Saturday. If their team work and banner work is anything to go by, Ajax will have to work hard to get past them on Sunday. Good luck boys and let’s get a big Fitzroy crowd down to support Trent Coleman and his team. The final home game lunch of the year will see us acknowledge the greatest contributors to the club over the last 25 years. Earlier this season as part of their 125-year celebrations, the VAFA had all clubs name their four great contributors since the centenary of the competition. You will hear from each of Graham Burgen (coach), Stephen Drury (premiership captain and player), Lloyd Browne (umpire) and Bill Atherton (volunteer). The late 90s and early 2000s was a great period for the Fitzroy Reds and the names reflect the achievements of those teams. The game is the FitzroyIT game to acknowledge our major sponsor and it will be a crucial day, with Fitzroy facing Parkdale. Each team is desperate to stay up in the Premier B competition and it is likely to come down to this game. It is also the game the two clubs play for the Norm Johnstone Trophy. Do not miss it! It will be a big day one way or the other and certainly a fabulous opportunity to say thank you to the people who have made a big contribution to our club and the Reds who came before it. Tickets for lunch can be purchased now and you must book by next Thursday (or before we sell out). In the week he plays his 150th VAFA game, we pay tribute to a quality player and a quality person. 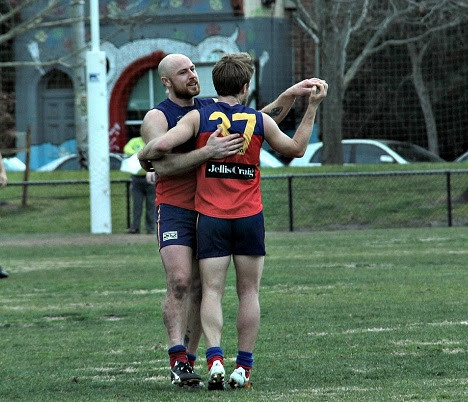 When close friend and long-term team mate, Max Ellis, casts his mind back he remembers Cailean Moore coming to Fitzroy half way through the 2010 season as a renowned gun. Cailean and Max, went on to play in the winning U19 grand final that year and have played together ever since. Through thick and thin. This season Cailean – Seymour to his teammates and fans around the ground – has cemented his place in the senior side and according to coach Nick Mitchell, has been a mainstay. “He’s done everything asked of him, week in week out, and hasn’t looked like losing his spot,” says Nick. “In the last month we’ve given Cailean some significant roles on the opposition’s best players and he’s been successful on every occasion. He thrives on the challenge. “Fact is, you can ask Cailean to do whatever you like and he’ll do it to the best of his ability, no questions asked. This season’s successes come on the back of a determination and willingness to prepare, not but physically, but mentally. “Whatever he can do to help the team and his mates, he’s prepared to do,” says Nick. “He has the ability to push himself harder on the track and on the field than virtually anyone else in the team. Having no argument with the coach’s assessment of his football abilities, Max and Rory also agree that Cailean is “all quality”. “He’s just a good bloke,” says Max. “A top bloke,” says Rory. Fitzroy will host an extended post-match with the players after the final home game at Brunswick Street Oval for 2017 and you’re all invited. The Community Room is the place to be for some fun and frivolity and there are some big prizes on offer. A $50 entry fee will include finger food and five drinks from 7-11pm on Saturday 26 August. It will also buy you entry into the games. The players will have some surprises for you. Ideally you come in pairs. This has become something of an end of season tradition, so please join us. Given the final game is against the Parkdale Vultures for the Norm Johnstone Trophy and a lot rides on the result, it will be a big day to say the least. You’ve heard of a storm in a teacup? 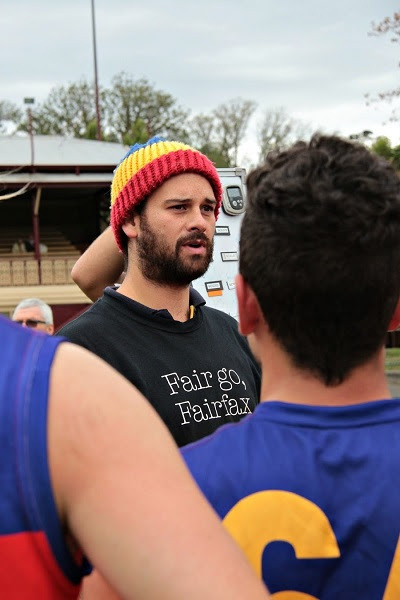 Wait till you’ve heard the one about the tea cosy that spawned a beanie craze at Fitzroy. It started innocently enough when President and dedicated tea drinker Joan Eddy was espied by Kerry Winchester (mother of captain Rory and canteen stalwart) turning up to a preseason camp armed with teapot, strainer and tea cosy. Kerry’s mother Dot heard the stories (not all we hope and, we might ask, what happened to the ‘what happens at the preseason camp stays at the camp’?) and went to the trouble of knitting Joan a special tea cosy in Fitzroy colours. Like her daughter, Dot is up for any challenge and Rory rocked up to the following pre-season practice match with a bagful of his grandmother’s knitted beanies. The rest, as they say, is history. Joan calculates that that was about three seasons ago and since then, Dot has continued her supply of FFC beanies. And each year she’s been joined along the way, slowly but surely, by a growing army of other (mostly) grandmothers and mothers on the needles, including Al Green’s mother in law and the grandmother of W1 full forward Liz Olney. This love and dedication inspired Louise Maniatakis (someone who knows a thing or two about love and dedication) to design and crochet bespoke beanies for senior players and volunteers – one for the women, one for the men, and one for the volunteers – amounting to over 100 in all. Getting into the spirit of the beanie, Wendy Symonds (another of our loyal volunteers) has done a great job over the last two seasons sourcing bargain price wool to give out to fellow volunteers willing to take on the knit. 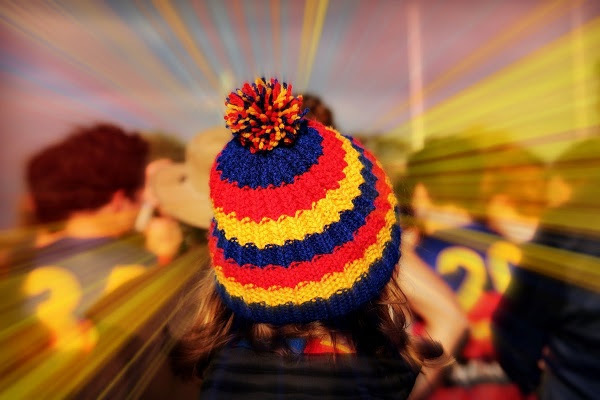 The craze has caught on far beyond Fitzroy with Brisbane Lions players – both women and men – now wearing the new supporter-styled knitted beanie and reputed to be the envy of their AFL team mates. 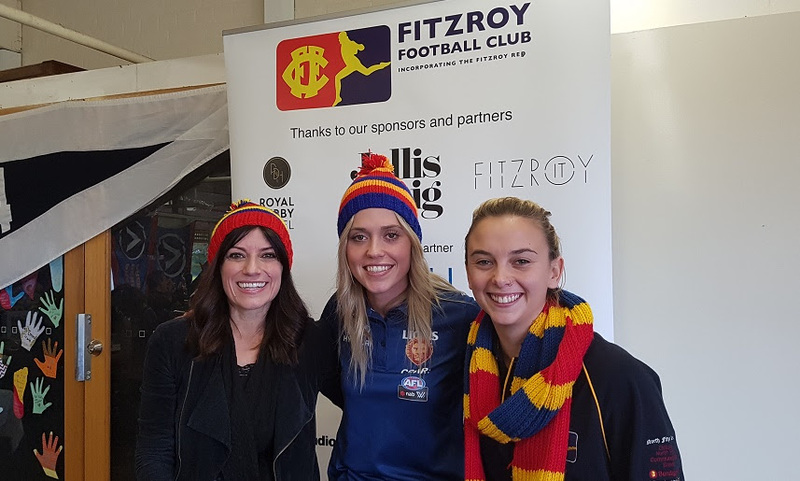 Indeed, star AFLW Brisbane Lions and Melbourne Uni goal kicker Kaitlyn Ashmore took the opportunity of speaking at our recent luncheon to stock up on her supply of supporter beanies from the Fitzroy merch stall. She also wanted to grab some of the beanies she saw the Fitzroy women wearing at the lunch but Joan let her down gently, explaining that the only way to she’d get to wear a Fitzroy women’s beanie was to sign up as a Roy girl. 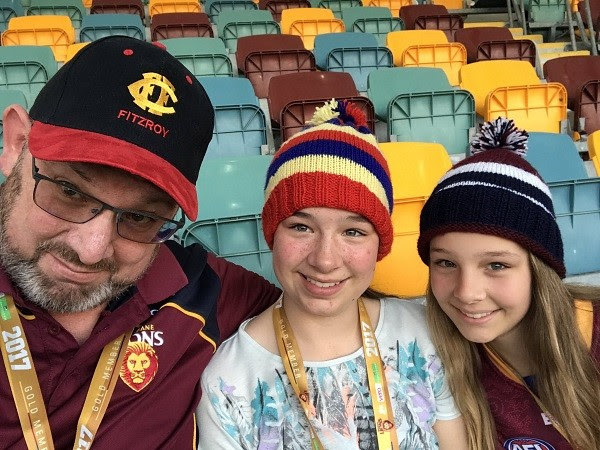 Fitzroy reached another beanie milestone last week when our first online request came in from a Brisbane-based Lions supporter for a Fitzroy supporter beanie. Now Mia Sutherland, who tragically went down late in the season with an ACL, is licking her wounds and recovering planning to aid her post-surgery recovery by knitting up a storm of Fitzroy beanies over the six-week off season. 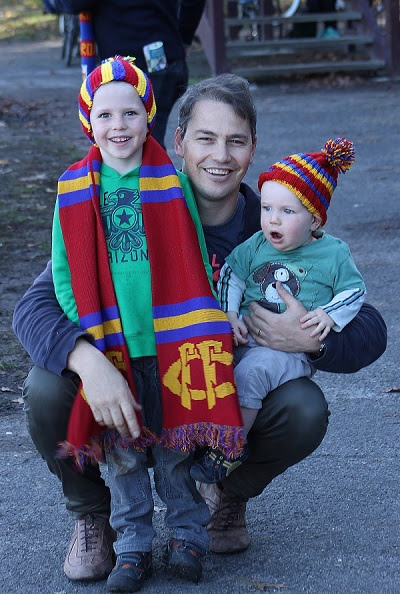 And that’s just the last instalment in the Fitzroy beanie story. As Joan says, with many more chapters still to play out, Viva La Beanie Fitzroy! Thank you to everyone who sold and bought tickets in the Club’s major raffle for 2017. The Club would like to extend its thanks to the sponsors of the raffle – the Brisbane Lions and Caltex Australia.